JBoss EAP 6.3 hold the CustomerRESTWebSvc.war run on JVM, it supply REST WebService http://localhost:8080/CustomerRESTWebSvc/MyRESTApplication/customerList for list all exist customers. Note that: In this exanple, JBoss EAP 6.3 run on localhost. Click this doc for how build and deploy CustomerRESTWebSvc.war. A Virtual Database (VDB) is an artifact that defines the logical schema model combining one or more physical data sources to provide easy data integration. 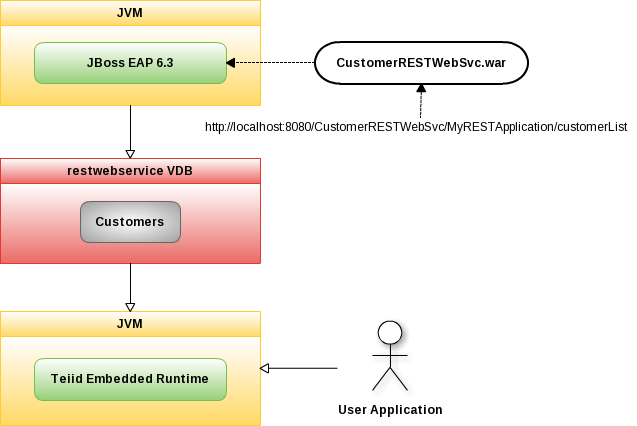 In this example, restwebservice VDB has Model Customers point to Rest Web Service run on JBoss Server.